A few months back I wrote a post how to flash factory / Stock images (Full ROM) on Nexus devices. 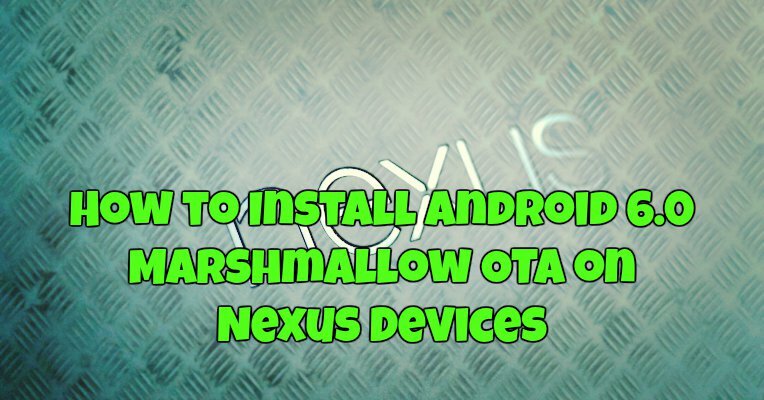 Now today here in this guide I will show you how to flash the Android 6.0 Marshmallow OTA updates on Nexus Devices. This guide will work on any Nexus device. (Nexus 5x, Nexus 6P, Nexus 9, Nexus 7, Nexus 6, Nexus 5 etc). Google recently released the Android 6.0 Marshmallow OTA (over-the-air) updates for those who wish to install them manually. Currently, the android 6.0 Marshmallow OTA are available for the Nexus 5, Nexus 6, Nexus 7 (2013), Nexus 9, and Nexus Player — and most of them come in multiple parts. If you can wait for the over the air (OTA) update and want to flash them manually, here is the complete step by step tutorial that you can follow n your phone. NOTE: – Many of these OTA updates comes in part, This is because Google recently rolled out security patches for most of its Nexus devices. So please check out which build you are using and choose the correct OTA file from the below mention links courtesy of Droid-Life. Be sure you choose the model number that matches your device. Step 1. Download and Setup ADB Fastboot drivers here. Once completed you will see fastboot/adb folder on your C drive (C:\adb). Step 3. Enable the USB Debugging mode on your device, Go to the Settings » select About device » Scroll to the bottom and tap on “Build number” seven times to enable developer options. Now the developer option is visible on your phone settings. To Enable USB Debugging again go to Settings » select Developer options » Tick the “USB debugging” checkbox (under Debugging section). Step 4. Now connect your Nexus to the PC with USB cable and open command window inside the ADB folder. Press “Shift + Right click” on any empty white space inside the folder and then select “Open command window here” option from the context menu. Step 5. To check that your device is recognized, enter the following command in command prompt. You should get a serial number followed by “device.”. This means your phone is connected. Step 6. Now Type the following to boot device in bootloader mode. Step 7. Your device will now reboot to the bootloader. Use Volume Down on your device to until you see “Recovery.” Select it with the Power button on your phone and very soon your phone will boot to an Android logo with an exclamation mark. To jump past this, press Volume Up and Power at the same time. Step 8. Now you will see the Stock recovery screen on your phone. Step 9. With Volume Down, highlight “apply update from ADB.” Press Power to choose it. Step 10. Now enter this command to apply the update.zip file (Same file that you renamed in step 2) on your Nexus. Now the flashing process will start on your phone. Note: If your Marshmallow update comes in multiple parts like Part 1 and part 2, you will need to install them separately — and in the right order — using these steps. They may mean you have to repeat steps 4 through 10 again to install the second part. Step 11. Once it has finished, simply reboot and enjoy the Android 6.0 Marshmallow OTA on Nexus Device.